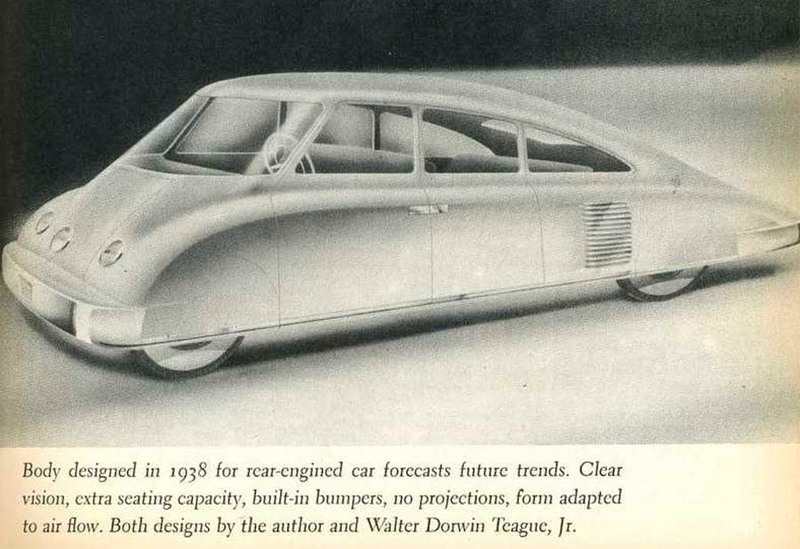 In our older article "Aerodynamic Marvels" we covered the most amazing examples of American aerodynamic prototypes from the 1930's and 1950's. 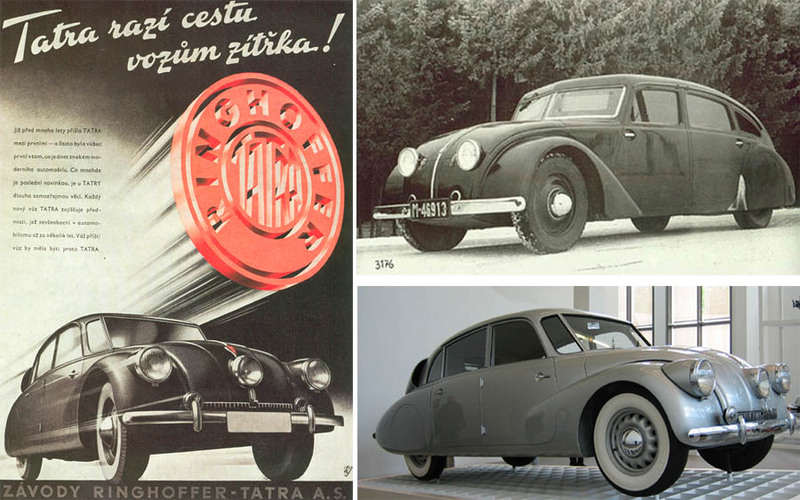 However, streamlined cars were also quite the rage in Europe before WWII: Tatra T87 made in Czechoslovakia in the mid 1930's, is the best example. With top speed approaching 100 mph, efficient aerodynamic characteristics, weird triple headlights and an air-cooled engine in the back, this car sported radical looks and even more radical engineering. 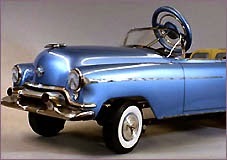 The only American car approaching it in terms of innovation at the time would be Tucker 48, although "the Tucker story" merits its own article (the car did not go over too well with the American car industry back then, alas). 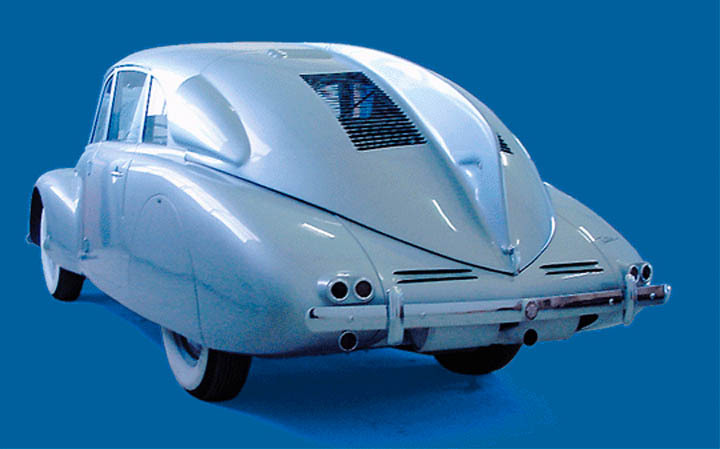 The internet is a big place, so there is already a site dedicated to old Tatra cars: International Streamlined Tatra Site. 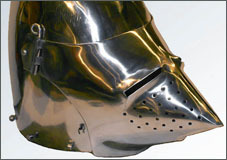 We strongly recommend checking it out for the various details of this car's exceptional history. 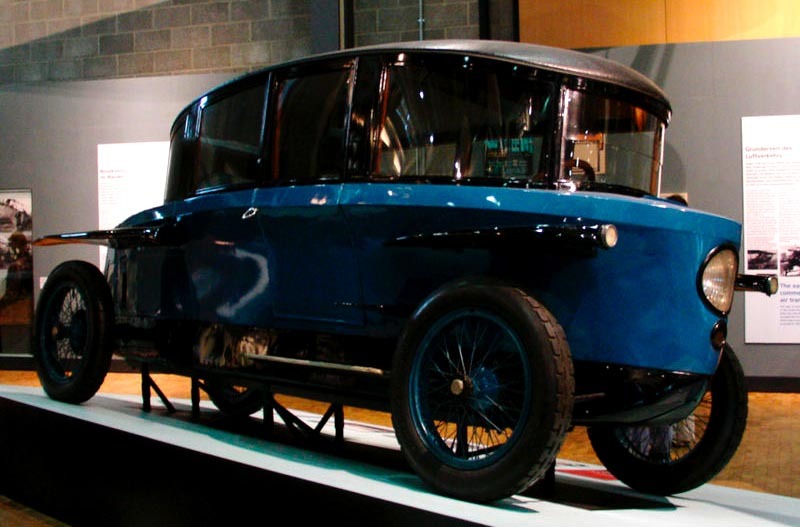 The "Tatra" company was known since the mid 19th century as a manufacturer of carriages and rail coaches, but after Austrian-born engineer Hans Ledwinka joined the company, it switched to automobile production. 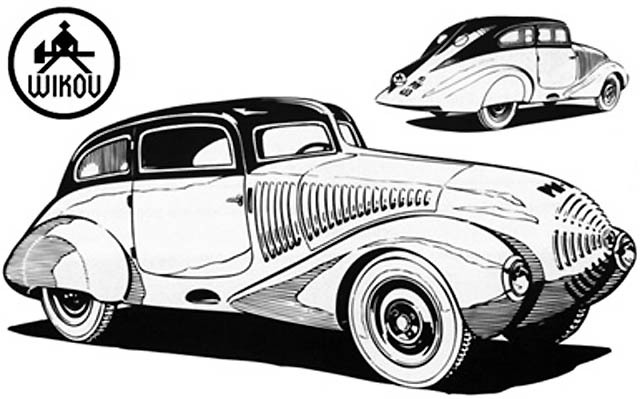 Everything changed again in the 1930s, when Hans introduced pioneering air-cooled rear-engine design, drastically different from all other box-shaped cars at the time. 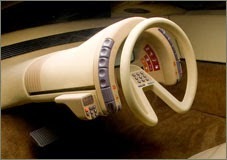 Not only did they sported a headlight in the middle of a car, but some of the T77 models also had the steering wheel located in the center of the dashboard! 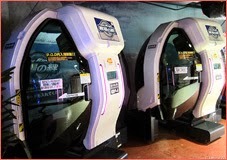 The driver sat slightly ahead and between the front seat passengers, almost like a pilot in an airplane. 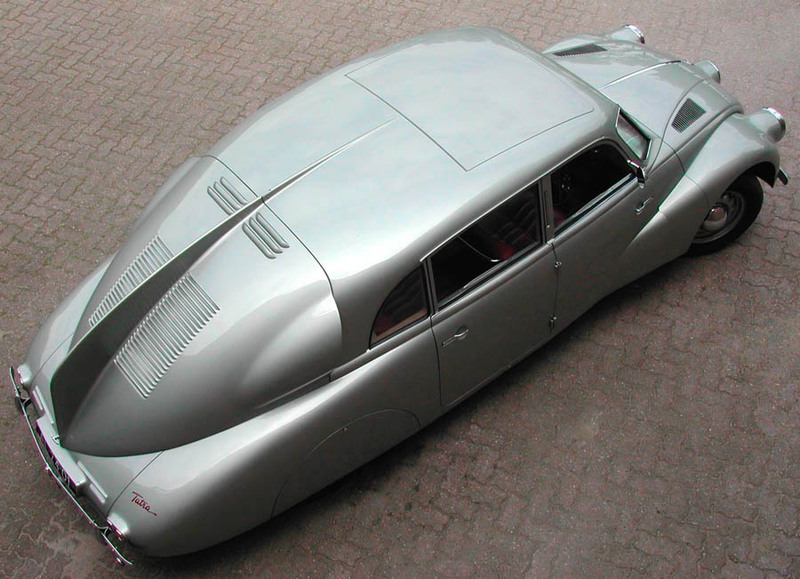 ....and further in the 1950s Tatra still looked very strange, but certainly rather elegant. 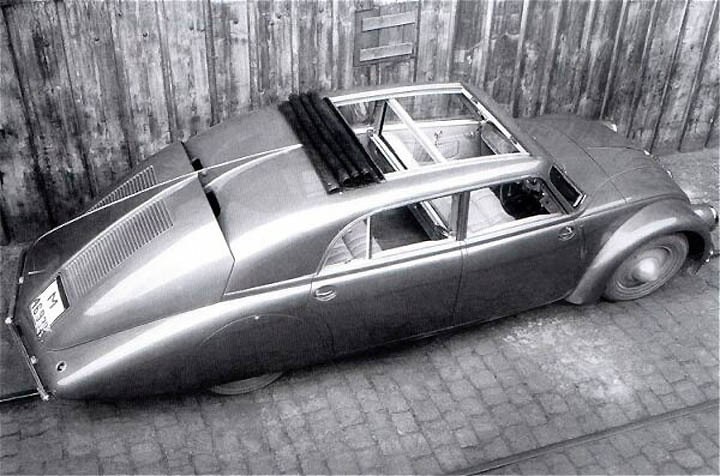 Shortly after the war the original mastermind behind Tatra cars, engineer Hans Ledwinka, was imprisoned by Communists for suspected collaboration with the Nazis... and then rehabilitated. 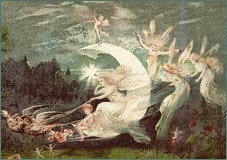 After which, he wisely emigrated back to Austria. 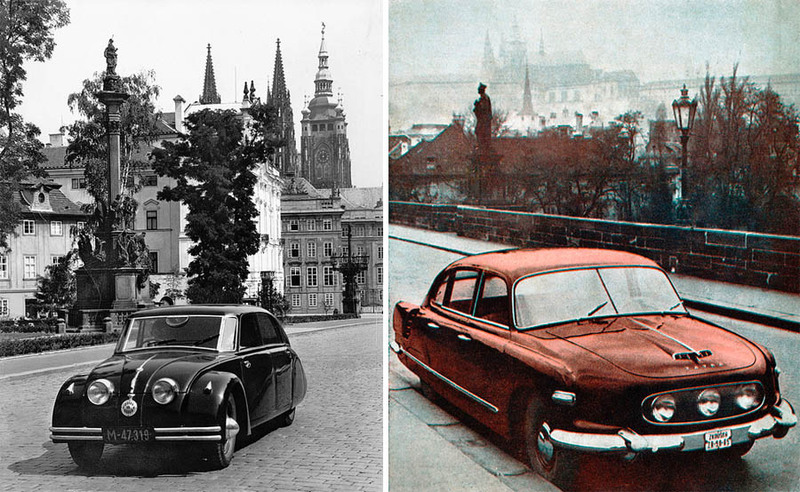 So even though the post-war Tatras were pleasing to the eye, but were nowhere as radical as the old ones. 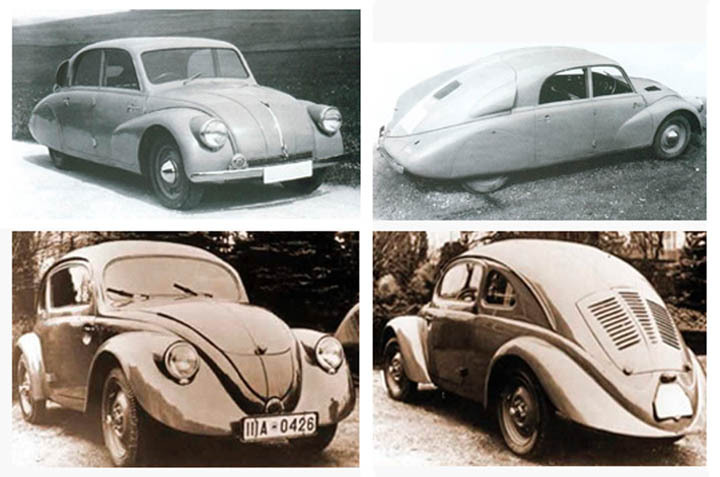 Paul Schilperoord writes: "In the late 1930s it became clear that VW had used several patents of the Tatra factory. It's likely Porsche used these patents because of the enormous presure from Hitler to develop the KdF-Wagen in a short time and on a tight budget. 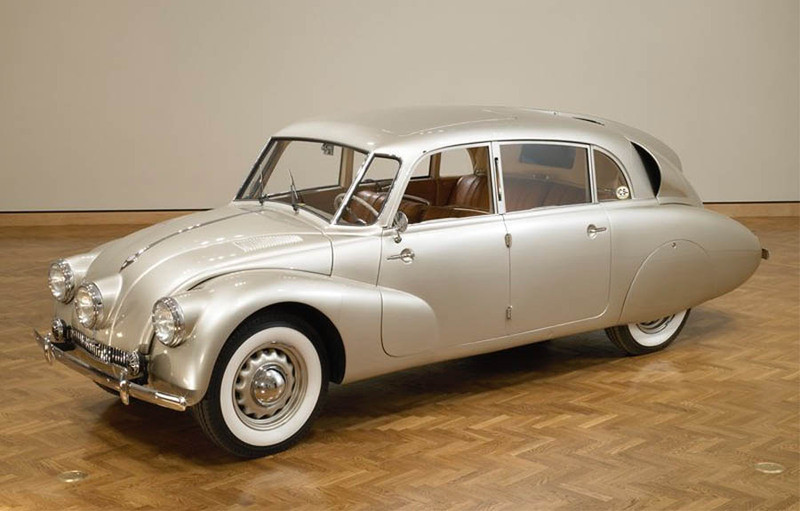 Just before the outbreak of WWII Tatra had ten legal claims against VW for infringement of patents. 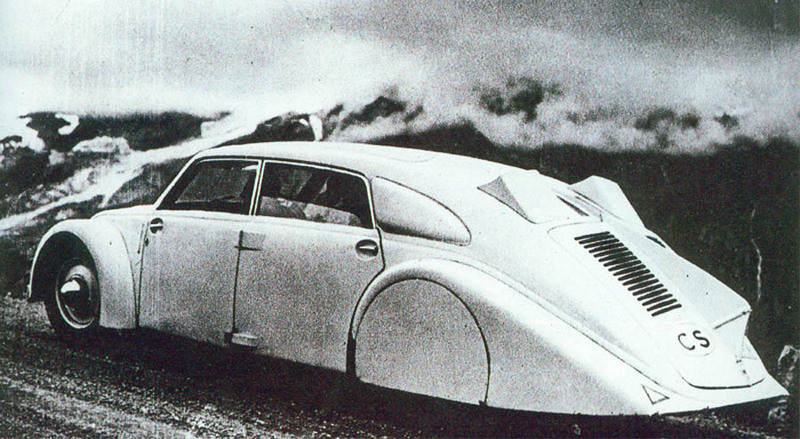 Although Porsche was about to make a settlement with Tatra, Hitler stopped him and told Porsche he would "solve this problem". 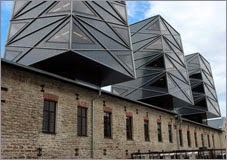 Shortly after he invaded Czechoslovakia and gained control over the Tatra factory. Hitler immediately stopped the production of the T97 after only 508 cars were built. The T97's big brother, the V8-powered T87, did remain in production during the first years of the war. The T87 was considered by German highcommand as the ultimate car for the new German Autobahns and was a real favourite amongst German officers." 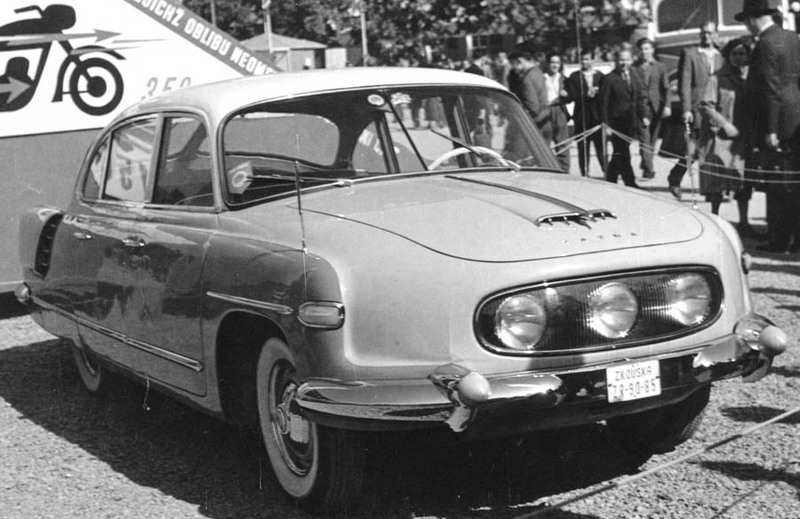 Tatra was not the only company producing streamlined cars in Europe, and even not the only one in Czechoslovakia. 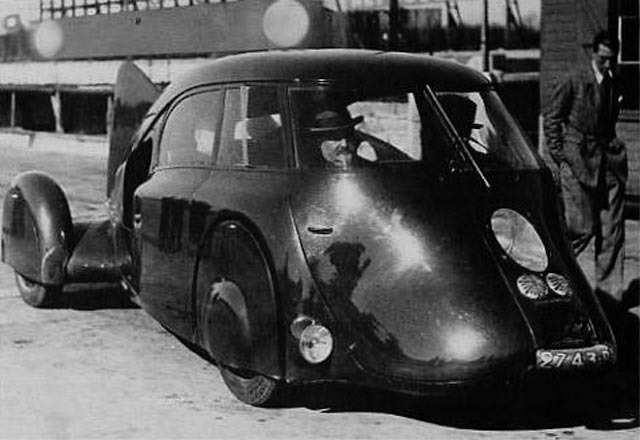 Here is Wikov Type 35 car, having the similar airplane-fashion approach to its design. 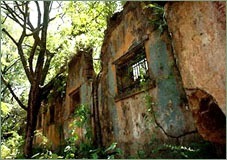 Note the curved window panes: they were used here for the first time. 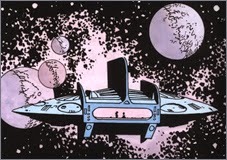 Aerodynamically speaking, it was almost sensational: its coefficient of drag was only 0.28. The driver sat in the front-center, behind him was space for four passengers. Only 100 cars were built, mostly due to the weak 6-cylinder engine and the obvious absense of trunk space. 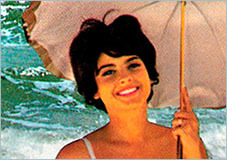 (Trunks were attached to later models as an after-thought). 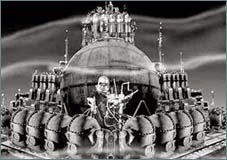 This car became famous in another way: Fritz Lang used a number of them in his legendary "Metropolis" movie. Thanks to Daniel Wenzel for this tip. 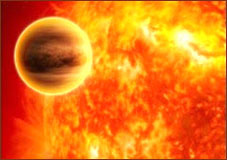 Please have a look here. 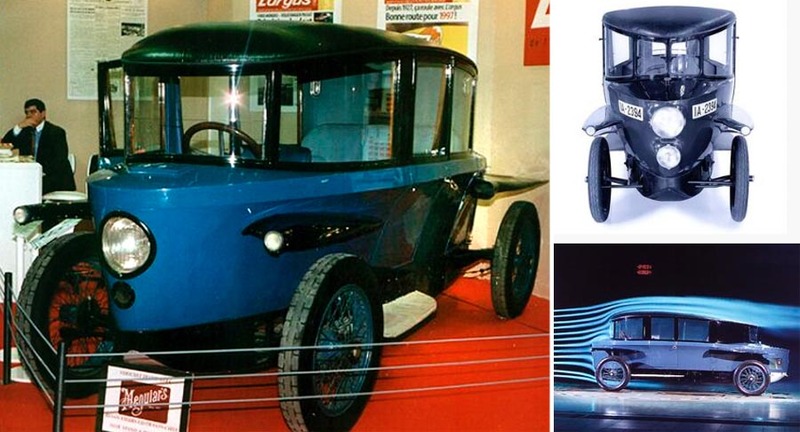 The first aerodynamic car - made in 1923 by Aurel Persu. 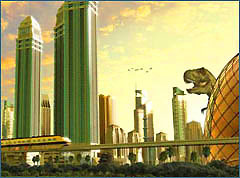 Could you add it to your list? 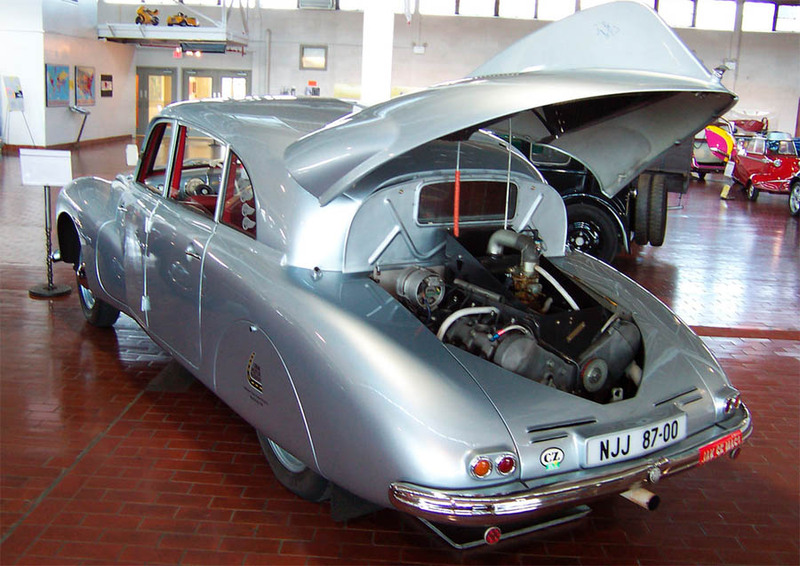 for me simply the prettiest car..
a buddy who is into military history told me that the Tatra was a death trap for German officers who drove it too fast because it over steered and that after several deaths they were not allowed to used them.any truth to that?